James Madison (who wrote the Constitution together the Bill of Rights): "The highest number to which a "standing army" can be carried in any country does not exceed one hundredth (1/100) part of the souls, or one twenty-fifth (1/25th) part of the number ABLE to bear arms. This PORTION would not yield, in the United States, an (standing) army of more than twenty-five or thirty thousand men. To "these" would be "OPPOSED" (APP: indicating that the "militia" is to be a "OPPOSING force" to the standing army as well as that of foreign enemies) a (CITIZEN) MILITIA amounting to near half a million CITIZENS with arms in their HANDS, "officered by men chosen from "AMONG THEMSELVES", (not by government or the standing army - a indicator of the true definition of "MILITIA") fighting for "their" (the citizen / militia's) common liberties and united and conducted by government"S" (local) possessing their (the citizen / militia's) affections and confidence. It may well be doubted whether a militia thus circumstanced could ever be conquered by such a "proportion" (ratio) of regular troops (i.e. standing army). Besides the advantage of (the CITIZENS) being armed, it forms a barrier against the "enterprises of ambition" (Banks, Corporations Foreign Interests), more insurmountable than any which a simple government of any form can admit of. The governments of Europe are afraid to trust the people with arms. If they did, the people would surely shake off the yoke of tyranny, as America DID. Let us not insult the free and gallant citizens of America with the suspicion that they would be less able to defend the RIGHTS of which they (THE PEOPLE) would be in "ACTUAL POSSESSION" than the debased subjects of arbitrary power would be to rescue theirs from the hands of their oppressors." 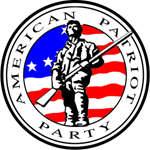 See More Constitutional insight at: American Patriot Party.CC - Get Educated. Welcome to Pacific Westcom, the Pacific West Coast's premiere US Pacific West Command Web Center Station for US Pacific News, US Pacific West weather, US Pacific West Coast sports and travel; US Pacific West Coast entertainment, usarpac and world wide access to the best international & US sites on the Web! "A standing military force with an overgrown Executive will not long be safe companions to liberty. The means of defense against foreign danger have been always the instruments of tyranny at home." Dwight D. Eisenhower's Secretary of Agriculture, Ezra Taft Benson giving a speech entitled "Stand Up For Freedom." Third State to Nullify federal powers. Kentucky and more to come. (COLUMBUS, Ohio) -- Ohio Attorney General Richard Cordray today joined the U.S. Federal Trade Commission (FTC) and 34 states in announcing an agreement reached with LifeLock Inc., a Tempe, Ariz.-based identity theft protection provider. The agreement resolves an investigation into the company's misleading advertising practices. "It is especially unsettling when consumers, who are already concerned about being victimized, take steps to protect themselves from deceptive practices and are misled by the very people who claim to offer help," said Attorney General Cordray. "This settlement will provide millions of dollars in restitution to consumers, including Ohioans, who were harmed by LifeLock. It will also level the playing field for reputable companies that do offer services to help protect against identity theft." The FTC and the states began jointly investigating LifeLock amid allegations that the company made a range of deceptive claims that misled consumers to believe its services were a "proven solution" that would protect against all forms of identity theft, including criminal, mortgage and child identity theft. The settlement also resolves allegations that the company misrepresented the nature of specific services it provided to protect or alert consumers when their personal information had been compromised. Although the FTC and state attorneys general share jurisdiction to investigate unfair and deceptive practices against consumers, a joint enforcement action of this magnitude is unprecedented. LifeLock sells identity theft services that past advertisements claimed were "guaranteed" to protect consumers' personal information and prevent criminals from using it to open accounts in their names. Some ads even included CEO Todd Davis' Social Security number, which Davis said, showed "how confident I am in LifeLock's proactive identity theft protection." LifeLock's advertisements also implied that individuals with fraud alerts on their consumer reports will always receive a phone call prior to the opening of new accounts, when in fact a phone call is not required by federal law. * Protect against all types of identity theft. * Constantly monitor activity on each of its customers' credit reports. * Always prompt a call from a potential creditor before a new credit account is opened in the customer's name. * Eliminate the risk of identity theft. LifeLock is also prohibited from overstating the risk of identity theft to consumers, including whether a particular consumer has become or is likely to become a victim. Past marketing materials have warned consumers about their heightened risk of identity theft when LifeLock did not have information to warrant such a warning. LifeLock agreed to pay $11 million in restitution to consumers. The FTC and states will jointly send letters to eligible consumers, notifying them of the agreement and how they can opt-in to the settlement. The exact number of eligible consumers, including the number of Ohio consumers, will be determined during the restitution process. LifeLock also agreed to pay a total of $1 million to cover the costs of the states' investigation. The settlement, by an Agreed Entry and Final Judgment Order, will be presented to the Franklin County Common Pleas Court for final approval this week. Federal and state laws provide consumers with a variety of tools to help protect themselves against identity theft. Consumers who have a reasonable suspicion that they have been or are at risk to become victims of identity theft can place free fraud alerts on their credit reports by contacting one of the three major credit reporting agencies. In addition, consumers can obtain free copies of their credit reports to review their own credit histories and identify errors and inaccuracies, such as unauthorized accounts. Consumers are also best-positioned to monitor their own bank accounts and credit card statements for unauthorized withdrawals or charges. Victims of identity theft in Ohio can get additional help with their identity recovery through Attorney General Cordray's Identity Theft Verification Passport Program, which helps victims restore their good name and credit. For more information on the program, go to www.OhioAttorneyGeneral/IdentityTheft. In addition to Ohio, states participating in today's agreement include: Alaska, Arizona, California, Delaware, Florida, Hawaii, Idaho, Illinois, Indiana, Iowa, Kentucky, Maine, Maryland, Massachusetts, Michigan, Missouri, Mississippi, Montana, Nebraska, Nevada, New Mexico, New York, North Carolina, North Dakota, Oregon, Pennsylvania, South Carolina, South Dakota, Tennessee, Texas, Vermont, Virginia, Washington and West Virginia. "... The Constitution has taken a medium between the two extremes, and perhaps with more wisdom than either the British or the state governments, with respect to their >>>"ELIGIBILITY" to OFFICE. "NOR" "OLD ONES" of which they "INCREASED THE SALARIES"." Would this not keep LEGISLATORS from being reelected "back" into their office...if they had RAISED THEIR SALARIES IN THE PREVIOUS TERM??? Global Warming Called Off by Scientists - CBC, Canadian Broadcasting, Special 44 Minute Video Report.